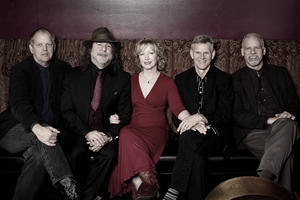 Boasting guest artists Herb Pedersen, Chris Hillman, Joe Craven and Skip Edwards, the album represents the work of the Hilonesome Band for the last two years since releasing the critically acclaimed "White Swan" in March of 2013. Recording began in January 2014 with Herb Pedersen and Chris Hillman joining us in the studio to create our version of J.D. Souther's classic song "Prisoner in Disguise." Besides "Prisoner," other cuts on the album include six originals from their own Rob Carlson, along with covers from David Olney, Denise Hagan and Ernest Troost. The feel of the album is decidedly Americana, a true melting-pot of folk music sounds including standard country, contemporary folk, Texas swing, Joni Mitchell-style jazz-rock, traditional old-country ballads and bossa-nova-style jazz, with the classic 70's sound of "Prisoner in Disguise" featuring Hillman and Pedersen topping off the eclectic mix. Pedersen also appears on several additional cuts on guitar, vocals, resonator guitar and 5-string banjo. Leading off is the song, “Independence”, an original with a newgrass/Celtic instrumental calling up the specter of Irish anthems of glorious historical pasts. The title song, “Not That Kind Of Girl” (also an original) is a new classic country tune in the style of Patsy Cline celebrating fidelity in an amusing double –entendre play on words. “Heartland” is a gorgeous heartfelt ballad from major Irish composer, Denise Hagan. “Millionaire” is a cover of Americana music compatriot, Dave Olney with a strong lead vocal from mandolinist, Steve Rankin. “That’s How I Learned To Sing The Blues” is a Henry Hipkens song that boasts a humorous and great performance from bassist Fred Sanders. “The Mountain”, “Don’t Resist Me” and “This Old House” are all originals with “This Old House” featuring Herb Pedersen on resonator guitar. “Dens of Yarrow” is a traditional ballad that is performed in the old style of the Irish presentation with voice, fiddle and accordions only. Cherished ‘70’s power ballad, “Prisoner In Disguise” (from J.D. Souther via Linda Ronstadt) features Herb Pedersen on guitar and harmony vocals and Chris Hillman on mandolin. There is a video in production for this song that features both the band, and Pedersen and Hillman. Kerriville New Folk winner, Ernest Troost is covered with the song, “The Last To Leave” and the record ends with another Carlson original, “Never Give Up” which featured percussion by the great Joe Craven (formerly of the David Grisman Band).